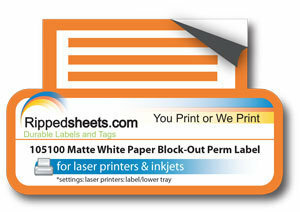 This matte paper label material features a bright white face stock with a dark adhesive on the back. The colored adhesive completely covers up all underlying print making the label completely opaque. Print quality is excellent on its smooth Facestock. The acrylic adhesive is adaptable to many surfaces with a minimum application temperature of 32°F and a service range of -4ºF to 248°F. The liner is a 2.7 mil White Kraft layflat liner. This material is RoHS compliant. Tensile Strength MD: 36 lbf/in. Tensile Strength CD: 18 lbf/in. This white paper stock is coated on the reverse side with an opaque, blue acrylic and is designed for use as a block out material when print-through must be eliminated and total cover-up is necessary. It is especially made for inkjets, lasers and photocopiers. The adhesive is a clear, permanent. Lignin-free, machine finished white paper with reverse side opaque coating. Note: For best bonding conditions, application surface should be at room temperature or higher. Low temperature surfaces, below 32°F can cause the adhesive to become so firm that it will not develop maximum contact with the substrate. Higher initial bonds can be achieved through increased rubdown pressure. In order to get a true measure of the adhesive's effectiveness, the label should be applied and allowed to bond a minimum of 24 hours prior to evaluation. The above specifications are up to date and are the typical and accurate values. We cannot take responsibility for damage to the product that is caused by use outside of our control.